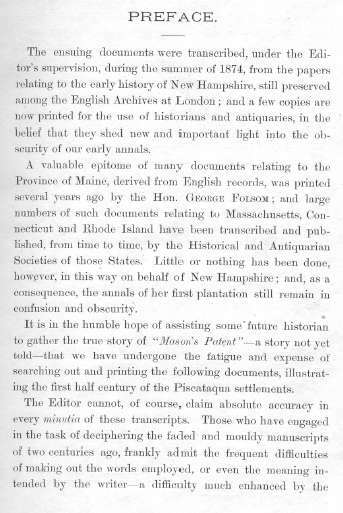 The book, "Transcripts of Original Documents in the English Archives Relating to the Early History of the State of New Hampshire," edited by John Scribner Jenness, Privately Printed, New York ,1876. Please note: This is not a paper book, it is a scan of the original paper book into the digital Adobe PDF format, written on a CD-ROM. You read this book on your computer using the free Adobe Reader software. It is a digital version of a hard to find book. If you could find a copy of the 1876 printed book, it would be very expensive. This is a very scarce and rare book. 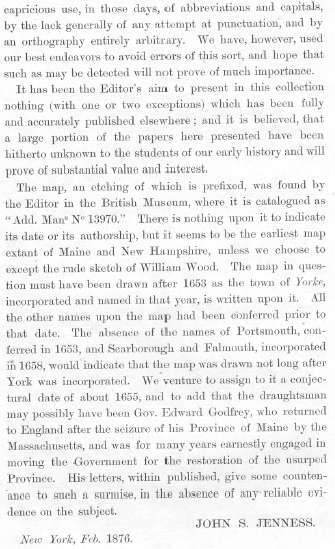 The data in it was excerpted from the original archives in England. 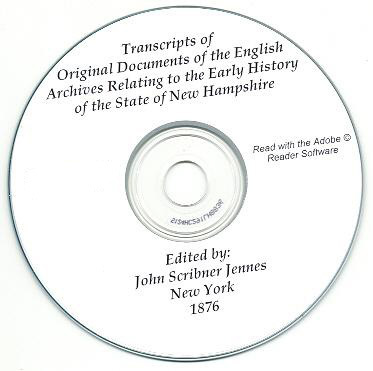 It contains important early New Hampshire genealogy information and valuable historical data for New Hampshire, Massachusetts, Maine and other New England areas. This 161 page book measures 7" X 10.5" with half leather & marbled board covers. The leather boards are scuffed and bumped with hinges that are pretty much separated from the spine. The spine/hinges have been taped. The pages are all present and still tight to the spine. The book was discarded from the Somerville Public Library in 1909. There is a library stamp on the edge of the pages & a small library punch-out on frontispiece. Please see the images. 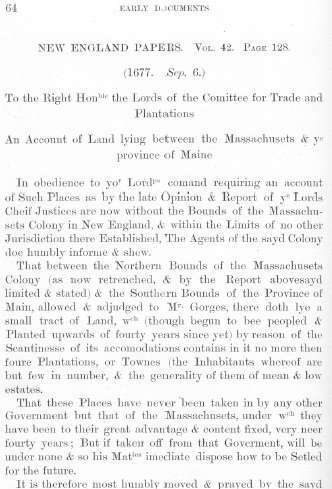 Abetts, Walter; Adams, Charles; Alde; Allin, Charles; Andros, Edward; Appleton; Atkinson, Joseph; Avery, Thomas; Bachiler, Nathaniel; Barefoote, Walter; Beard, Thomas; Becher, William; Beck, Henry; Berry, John; Bickford, John; Blake, Daniel; Blathwayt, William; Bowden, William; Bracket, Anthony; Bracon, George; Bradshaw, Richard; Broadstreet, Simon; Broderipp; Brown, John Sr.; Browne; Bruce, James; Bruester, John; Bulkeley, Peter; Buncker, James; Burdett, George; Burnum, Robert; Camock, Thomas; Camond, Abel; Canne, Joseph; Canning, Thomas; Cartwright; Cauny, Thomas; Chamberlain, Richard; Champernoon, Frances; Champernowne, Francis; Chasley, Phillip; Church, John; Clark, Edward; Clarke, John; Clements, Job; Clifford, John Jr.; Clifford, John Sr.; Clutterbuck; Colcord, Edward; Cole, Abraham; Cooke, John; Corbet, Abraham; Cotton, John; Cotton, Seaborne; Cotton, William; Coventry; Cranfield, Edward; Crispe; Crockett, Thomas; Cross, John; Cuffin, Peter; Cumins, Richard; Curwin; Cutt, John; Cutt, John Jr.; Cutt, Richard; Dalton, Samuel Jr.; Dalton, Samuel Sr.; Dam, John; Dame, John; Daniel, Thomas; Davis, John; Dawes, Abraham; Denmark, Patrick; Dennison; Derbarn, Godfrey; Dow, Daniel; Dow, Henry; Dowell, Henry; Downes, Thomas; Drake, Abraham Sr.; Drake, Frances; Drake, George; Drake, Nathaniel; Dudley, Samuel; Dudley, Theophi; Dudly, Billy; Dungan; Dunstar, Thomas; Earle, Robert; Earle, Thomas; Eastwick, Phesant; Eaton, John; Edgely, Thomas; Elbridge; Elliot, Robert; Emery, Anthony; Endicott, John; Euens, John; Eyre, Eliezer; Eyre, Thomas; Eyres; Fallingsby, Thomas; Fernalle, Samuel; Fifield, William Sr.; Fletcher, John; Follett, John; Follett, William; Footman, Thomas; Ford, Richard; Foullsam, John; Foullsham, Eph. 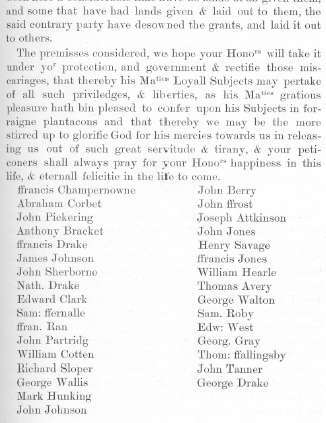 ; Foullsham, Peter; Foullsham, Samuel; Foulsham, John; Freyer, Nathaniel; Frost, John; Fryer, Nathaniel; Fuller, Daniel; Fuller, William; Furber, William; Gardiner, Christopher; Gardner, Henry; Garland, Peter; Gefford, John; Georges, Edward; Georges, Ferdinando; Georges, Robert; Gerrish, John; Gershom; Gibbs; Gibson; Gidney; Gillen, John; Gillman, Edward; Gillman, John; Gilman, Daniel; Gliten, Charles; Godard, John; Godfrey, Edward; Godfrey, Humphrey; Godfrey, Oliver; Godfrie, John; Goue, Edwin; Gouer, Edward; Gray, Frances; Gray, George; Griffith, George; Guy, Ehwin; Hacket, William; Haines, Samuel Jr.; Haines, Samuel Sr.; Hall, John Jr.; Hall, John Sr.; Hall, Linsley; Hall, Ralph; Hall, Samuel; Ham, John; Hamilton, Lenox; Hamm, William; Hammedleton, David; Hamock, Thomas; Hanckings, M.; Hanes, Mathias; Hanson, Thomas; Harall, John; Harben, James; Hassey, Cristopher; Haye, Robert; Heard, John; Hearle, William; Heden, Robert; Hende; Hill, John; Hilton, Edward; Hilton, John; Hingston; Hobbs, Mauris Sr.; Hody, John; Hollis, Benjamin; Hud, John; Huggins, Robert; Hull, Benjamin; Huncking, John; Hunking, Mark; Hunkings, John; Hunt, Bartholomew; Hussey, Christopher; Iraf, George; Jackson, John; Jackson, Richard; Jameson, Patrick; Jenkinns, Lyonell; Joceline, Henry; Jocelyne, Henry; Johnson, Edward; Johnson, James; Johnson, John; Jones, Frances; Jones, Ginkin; Jones, James; Jones, John; Jones, Robert; Jones, Stephen; Jones, William; Jourdon, Thomas; Keais, Samuel; Knowles, Hansed; Knowles, John; Laham, Richard; Lahorn, Henry; Lampree, Daniel; Lanftof, Henry; Larkham, Thomas; Lauers, George; Laurence, David; Layton, Thomas; Lea, Symon; Leader, Richard; Leare, Tobias; Learey, Conealles; Leaue, Samuel; Leavitt, Moses; Leverett, John; Lewis, Thomas; Marston, Epherhaim; Marston, Isaac; Marston, John; Marston, Thomas; Martin, Richard; Martin, Waldern; Martyn, Richard; Martyn, Richard; Mason, Ann; Mason, John; Mason, Joseph; Mason, Peter; Masons; Mather; Maverick, Antip; Mavericke, Samuel; Mendum, Robert; Meryan, John; Michell, John; Mills, John; Molton, Thomas; Moody, Joshua; More, William; Morgin, Richard; Mors, Obediah; Morton, Thomas; Mouton, Benjamin; Mouton, Henry; Nanney, Robert; Neale, Walter; Necoth, James; Nicholes; Nicholls, Richard; Norton, Frances; Norton, John; Nudd, Thomas; Nute, James; Nutter, Anthony; Oare, James; Orchard; Page, Frances; Palmer, Christopher; Palmer, Jeffrey; Pariaton, Robert; Partridge, John; Peck; Peeters, Hugh; Pendleton, Brian; Perkins, Abraham; Phillips, Israel; Phillips, John; Pickerin, John; Pickering, John; Pinckhame, Richard; Pomfret, William; Pottell, John; Povey, Thomas; Powell, Oliver; Powell, Robert; Purchase, Thomas; Purchis, Thomas; Ran, Frances; Rand, John; Randolph, Barnard; Randolph, Edward; Rann, John; Rannd, Francis; Ratcliffe, William; Rawlins, James; Rawson; Reshworth, Edward; Rigby, Edward; Rishworth, Edward; Roberts, John; Roberts, Thomas; Roberts, Thomas Sr.; Robey, Thomas; Roby, Samuel; Roe, Richard; Rolines, Thomas; Row, William; Salistone; Samber, William; Samborn, John Jr.; Samborne, John; Sambourne, Richard; Savage, Henry; Scamon, Richard; Scamond, Richard; Seauy, William; Seavey, William; Seavie, Thomas; Sewell, Edward; Shapleigh, Nicholas; Sherborne, John; Sherburne, Henry; Sherburne, John; Sherlie; Shipway, John; Shortridge, Richard; Shrimpton; Shukford, William; Sloper, Richard; Sloper, William; Smart, Robert Sr.; Smith, Bartholomew; Smith, James; Smith, John; Snell, George; Souter, John; Spencer, Thomas; Stanyan, Anthony; Starr, Edward; Stelene, Carlile; Stileman, Elias; Stileman, Richard; Stones, Nathaniel; Storer, William; Stoughton, William; Stratton, John; Styleman, Elias; Swaddon, Phillip; Sweet, Giles; Tanner, John; Taylor, Anthony; Teddar, Steven; Termly, Ralph; Thing, Jonathan; Trackie, Isaac; Trelanye; Tucke, John; Tucker, John; Tucker, Richard; Turner, William; Ugroufe, John; Underhill, John; Vaughan, William; Viniard, Naboth; Vynes, Richard; Wadleigh, Robert; Waldern, Richard; Waldern, William; Walderne, Richard; Walford, Thomas; Wallis, George; Walton, George; Wannerton, Thomas; Wastill, John; Watson, John; Watson, Robert; Watterhouse, Richard; Way, George; Wear, Nathaniel; Weare, Nathaniel; Webb, George; Webber, Richard; Webster, Adonias; Webster, John; Wedgewood, Jonathan; Weeks, Leonard; Wentworth, Samuel; Wentworth, William; Wesendouke, Stephen; West, Edward; Westbrooke, John; Wharton; Whiddon, Samuel; Whitaker, Lawrence; Wiatt, Frances; Widdon, John; Wiggin, Andrew; Williams, Abraham; Wilson, Humphrey; Winford, Ezekiel; Winget, John; Withers, Thomas; Wolstenholme, John; Wyer; Yorke, John; Yorke, Richard; Zearle, William & others. These names reflect the spelling as found in the book. The transcriptions are in 'old' English & spelling in the 1600's was pretty much as the writer wanted it. Please note: This is a scan of the original hard to find book, converted to Adobe PDF format and written on a CD-ROM.